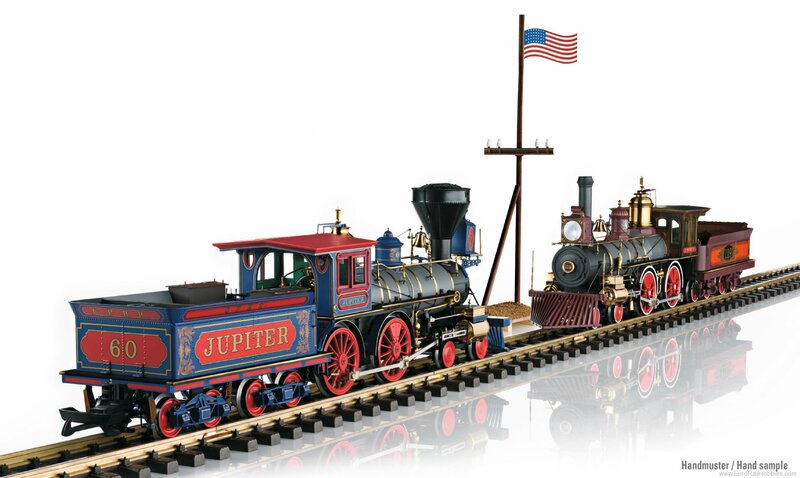 On May 10, 1869, the Central Pacific "Jupiter" and the Union Pacific "No. 119" came together after six years of construction on the transcontinental line. The tracks were symbolically joined together by a golden track spike. This completed the 1,776-mile east-west transcontinental connection in the United States. Even today, in the summer season, the origanal replica locomotives steam to the original scene in Promontory, Utah, to commemorate this historically important event. We celebrate this anniversary with a special LGB locomotive set consisting of both locomotives as finely detailed metal models constructed of brass and die-cast zinc in the tradition of the earlier LGB metal models. This is a set consisting of two steam locomotives as they looked at the opening of the first transcontinental railroad in the USA. The construction, paint schemes, and lettering are the same as the two replicas - Union Pacific RR locomotive "119" and the Central Pacific RR "Jupiter" locomotive as they presently are at the memorial site at Promontory Summit in Utah. These are finely detailed models with heavy metal construction including many separately applied details. Each locomotive is driven by a powerful motor, has an mfx/DCC decoder with many light and sound functions such as headlights, cab lighting, firebox lights, and much more. The running sounds and a whistle and bell activated by reed switches will also work in analog operation. Each locomotive has a built-in smoke unit with steam exhaust synchronized with the wheels as well as cylinder steam and steam exhaust at the whistle, when the latter is activated. The cab doors and smoke box doors can be opened. There is a coupling between each locomotive and its tender, which can be adjusted for two lengths. Length over the couplers for locomotive "119" 55 cm / 21-5/8", for "Jupiter" locomotive 52 cm / 20-1/2". A reproduction of an American track spike – constructed of metal and genuine gold-plated – is included with the models. In addition, there is also an American flag included with the locomotives. The locomotives are packaged in a quality wooden case. Item no. L29000. One-time series in 2019 for the 150th anniversary of the completion of the transcontinental railroad in the USA – limited worldwide to 299 pieces. Please note that the pictures are hand samples. The regular production may vary in details from the models shown. Call us for additional details, toll free 1-866-799-6098.